An increasingly global and connected market environment sees many service providers struggling to find a competitive position and to grow their business sustainably. The shift from a product-dominant logic to a service-dominant market logic pressures businesses to look for new and effective ways of engaging with customers throughout the innovation process. At the same time, managers are faced with so called ‘wicked problems’ that call for more creative problem solving and lateral thinking in corporate innovation practices. 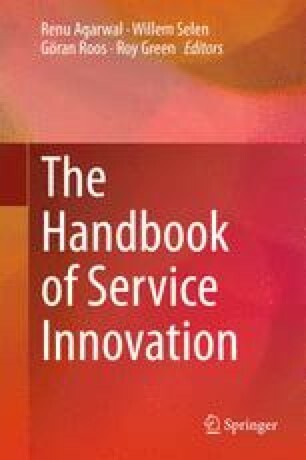 In this chapter we discuss how recent developments of open innovation and design thinking can be applied to services and assist in service innovation. We explore how the co-creation of value is itself a service innovation, and the simultaneous impact of such co-creation practices through relational conversations with customers and a broad range of stakeholders. Co-creation becomes an element of the service offering, drawing customers into the value web and blurring the boundaries of the firm. We do this by discussing three cases as examples of open co-created innovation, and reflect on implications for service innovation, especially where propriety of the service innovation may be ambiguous. In comparison with existing open innovation frameworks, we propose a co-creation approach to open service innovation that goes beyond common ‘inside out’ or ‘outside in’ dichotomies.